In terms of a home mortgage, envision that your monthly payments as the small force being applied to one end of a lever. That small amount of cash can produce enough lift (cash from the bank) to purchase your home. Our culture likely has you dissatisfied with your income, possessions and standard of living. 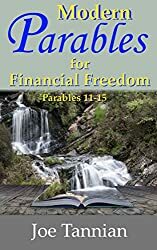 This book will help you with TRUE financial freedom. Twenty-five stories will entertain and enlighten. Begin to gain TRUE financial freedom. Read stories 1 -5. 1. Snapped: A young girl's experiment sadly relates to her parents disagreement. 2. Hairpin Turns: A young man experiences the generosity of a family. 3. The Pair of Bills: A counterfeiter or a prophet you decide. 4. The Heartless Cyborg: A bionic man doesn't know when to stop. 5. Paradise Skit: A honeymoon couple invest in paradise. Gain more TRUE financial freedom. Read stories 6-10. 6. Building Castles: Two types of castles and two types of families. 8. Plumb and True – Part 1: Four college buddies go camping and debating. 9. Plumb and True – Part 2: Raising a flag pole requires some give and take. 10. Go Fish: How to retire early. 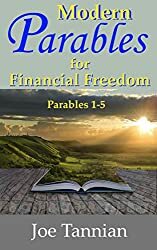 What is Modern Parables for Financial Freedom? 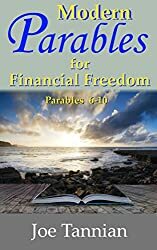 Gain even more TRUE financial freedom. Read stories 11-15. 11. Bows and Arrows: A young boy thinks he gets the best present ever. 12. The Woodworm Letter: A demon gets advice about dragging his assignment into the thorns. 13. Stan’s Pants – Guest story: A man's pants takes him places. 14. Which Tree Will It Be? : A poem about choosing the right tree for Christmas. 15. A Christmas of True Value: An old curmudgeon gives his best Christmas gift ever. 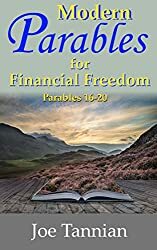 Gain even a bit more TRUE financial freedom. Read stories 16-20. 16. Scout’s 90 Seconds of Enlightenment: A dog has an out of this world experience that enlightens him and maybe you. 17 Melvin’s GRand dEED: a young couple helps a drunk and a doctor while visiting New York. 18. After the Conference: A young man commits to missions but has yet to talk to his wife about it. 19. After the Conference - Resolved: Sleeping in your car is not the way to solve your problems. 20. Change our Hearts: A poem about dancing with your partner through a project together. 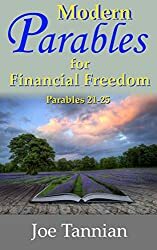 Gain even a bit more TRUE financial freedom. Read stories 21-25. 21. The Vision Maker: An anthropologist discusses an unusual obsidian relic. 22. Mac & Cheese – Guest story: How much Mac & Cheese is there in that pot? 23. A Finely-Tuned Machine: A dad operates a bit too much like his wristwatch. 24. The Security Deposit: Losing your deposit but gaining something more valuable. 25. My Car-Baby: A young couple celebrates a higher salary.